Why Judges Shouldn't Have Control Over Everything - Cannabis is a First-Line Treatment for Childhood Mental Disorders, by Tod H. Mikuriya, 8 Jul 06. Marijuana Medical Papers: 1839- 1972 - Edited by Tod H. Mikuriya, M.D. Marijuana and the Treatment of an 8-year-old Child with Multiple Psychiatric Diagnoses - Debbie Jeffries. Mr. X, by Carl Sagan. This account was written in 1969 for publication in Marihuana Reconsidered (1971). Sagan was in his mid-thirties at that time. He continued to use cannabis for the rest of his life. Dr. Jay Cavanaugh, Ph.D.: California State Board of Pharmacy, 1980-90; Past Chairperson, Los Angeles County Research Evaluation and Advisory Panel (REAP) for chemical dependency treatment and prevention. Outpatient drug treatment caseworker, Los Angeles County Health Department 1970-73. AAMC founder. 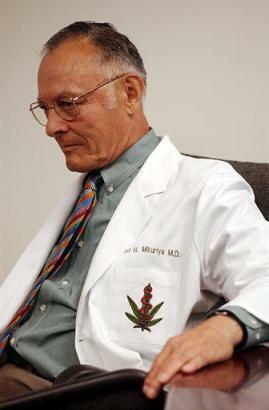 For the Sake of the Children The Message of Medical Cannabis - Dr. Jay Cavanaugh, Ph.D., September 2002. Anxiety Disorders. Neurobiology: Never fear, Cannabinoids are here - Pankaj Sah. Cannabis and Depression, and Bipolar Disorder - Dr. Jay Canavnaugh, Ph.D.
Hepatitus C - The Silent Killer. Can Cannabis Help? - Dr. Jay Cahavanugh, Ph.D.
by the Canadian government in 2002.
by the City of New York in 1944.
by The British government in 1894. The pharmaceutical industry markets, sells and profits greatly from prescription drugs that, at best, mainly work in 30% to 50% of people and, at worst, actually contribute to hospitalization, permanent disability, disease, illness and death. Prescription drugs have killed more Americans than the entire Vietnam War and on a yearly basis. According to the Journal of the American Medical Association (JAMA), prescription drugs are now the fourth leading medical cause of death in the U.S. and Canada, behind only cancer, heart disease, and stroke. The top ten drug companies (which included European companies) had profits of nearly 25 percent of sales in 1990. In 2001, the ten American drug companies in the Fortune 500 list ranked far above all other American industries in average net return, whether as a percentage of sales (18.5 percent), of assets (16.3 percent), or of shareholders� equity (33.2 percent). These are astonishing margins. For comparison, the median net return for all other industries in the Fortune 500 was only 3.3 percent of sales. The most startling fact about 2002 is that the combined profits for the ten drug companies in the Fortune 500 ($35.9 billion) were more than the profits for all the other 490 businesses put together (33.7 billion). Let me emphasize this again. The combined profits of the ten largest US drug companies reaches 35.9 billion - a sum higher than the combined profits for all other 490 corporations on the Fortune 500 List! When all the data was pulled together, it appeared that patients had improved - but those on placebo improved just as much as those on the drugs. All the odds ratios turned out to be less than one (one being equal to the control group's chances)! Compared with subjects who had used less than one joint year, the estimated odds ratios for lung cancer were .78; for 1-10 j-yrs, .74; for 10-30 j-yrs, .85 for 30-60 j-yrs; and 0.81 for more than 60 j-yrs. The estimated odds ratios for oral/pharyngeal cancers were 0.92 for 1-10 j-yrs; 0.89 for 10-30 j-yrs; 0.81 for 30-60 j-yrs; and 1.0 for more than 60 j-yrs. "Similar, though less precise results were obtained for the other cancer sites," Tashkin reported. Nonmelanoma skin cancer is one of the most common malignancies in humans. Different therapeutic strategies for the treatment of these tumors are currently being investigated. Given the growth-inhibiting effects of cannabinoids on gliomas and the wide tissue distribution of the two subtypes of cannabinoid receptors (CB1 and CB2), we studied the potential utility of these compounds in anti�skin tumor therapy. Here we show that the CB1 and the CB2 receptor are expressed in normal skin and skin tumors of mice and humans. In cell culture experiments pharmacological activation of cannabinoid receptors induced the apoptotic death of tumorigenic epidermal cells, whereas the viability of nontransformed epidermal cells remained unaffected. Treatment with a synthetic compound similar to marijuana reduced inflammation in older rats in addition to making the animals �smarter,� said Wenk, who is also a professor of neuroscience and molecular virology, immunology and medical genetics. The researchers presented their findings October 18 in Atlanta at the annual Society for Neuroscience meeting. Eli Lilly, Johnson & Johnson, and AstraZeneca have been making $2 billion a year selling useless pills to Alzheimer's patients (including almost a million Medicare "beneficiaries"). This is the bottom line of a study published this week in the New England Journal of Medicine that evaluated the effectiveness of Seroquel, Risperdal and Zyprexa, drugs known as "atypical antipsychotics," which are routinely prescribed to Alzheimer's patients. A group led by Lon Schneider, MD, at the University of Southern California School of Medicine found that 80% of Alzheimer's patients they studied stopped taking the drugs before the trial ended due to ineffectiveness and side-effects. The study was funded by the National Institute of Mental Health, whose director, Thomas R. Insel, commented "We need to come up with better medications." Indeed -more than 4.5 million Americans have been diagnosed with Alzheimer's. Its environmental causes remain unknown (the fake food must factor in) and it is occurring with increasing frequency. The rage associated with Alzheimer's is one of the conditions for which Oregon doctors can authorize cannabis use. Perhaps Dr. Insel should fund a study of its efficacy there -it's just a matter of collecting the data. These drugs are not only addictive but are tied by exhaustive scientific research to hostility and violence and, in some cases, murder and suicide. This condition is characterized by involuntary movements. These abnormal movements most often occur around the mouth. The disorder may range from mild to severe. For some people, it cannot be reversed, while others recover partially or completely. Features of the disorder may include grimacing, tongue protrusion, lip smacking, puckering and pursing, and rapid eye blinking. Rapid movements of the arms, legs, and trunk may also occur. Impaired movements of the fingers may appear as though the patient is playing an invisible guitar or piano. This web page and related elements are for informative purposes only and thus the use of any of this information is at your risk! In accordance with Title 17 U.S.C. Section 107 and The Berne Convention on Literary and Artistic Works, Article 10, news clippings on this site are made available without profit for research and educational purposes. Any trademarks, trade names, service marks, or service names used on this site are the property of their respective owners.